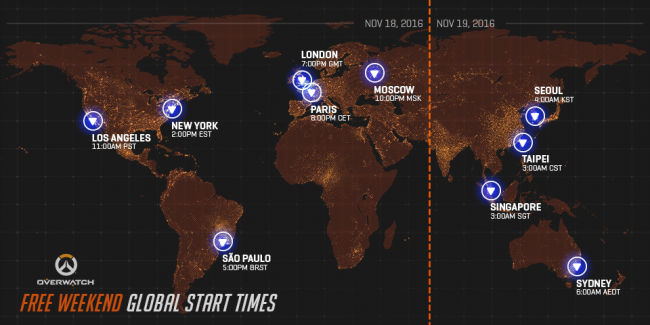 If you haven't jumped on the Overwatch hype train yet, now's your chance to check it out. Overwatch, Blizzard Entertainment's colorful team-based shooter, is having a free weekend this month. So, if you haven't had the chance to give it a whirl yet, you'll be able to try-before-you-buy. From November 18-21, anyone will be able to install and play the game on all three platforms: PC, Xbox One and PS4. You'll be able to pre-download the game ahead of time so you can jump right into the action when the free weekend starts. During the free weekend, all free players will have access to all 22 heroes and 13 maps that are available to play, including Quick Play, Custom Games and the Weekly Brawl. You'll also be able to collect loot boxes and level up your player level - and if you decide to go ahead and purchase the game after the weekend is over, all of your progress will carry over. It's no secret that Overwatch has been one of my favorite games this year so if you haven't had a chance to try it out I highly recommend it.